While national debt is no longer the focus for pundits and politicians, it’s still a major concern for investors; nations with high debt tend to become nations with very high debt, and nations with very high debt tend to have financial crises. 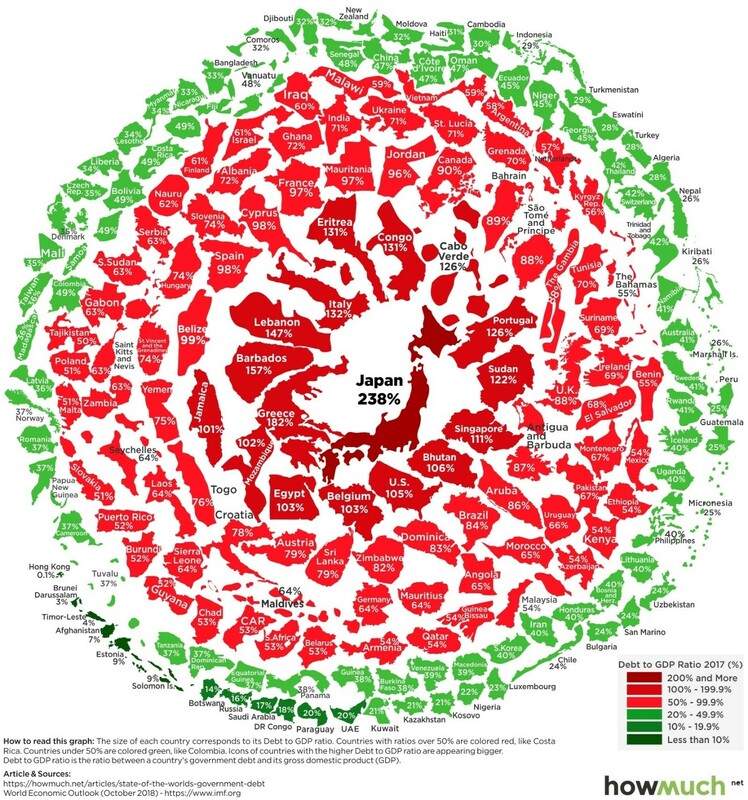 In a recent article, VisualCapitalist ranked the world’s economies by their debt-to-GDP ratios, from lowest to highest. We compared this list with our International Equity Index, VIEQX, and the country weightings of a cap-weighted index. 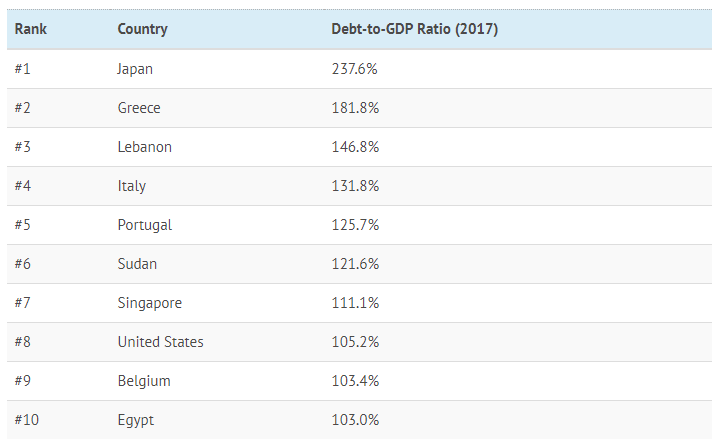 For 7 of the top 10 countries with the highest debt-to-GDP ratios in the world, VIEQX is either not invested in them at all, or underweight compared to a cap-weighted index. At the very top of the list is Japan, in which we have a roughly 7.5% weighting, compared to cap-weighted, which holds them at 16.4%. We are not invested in Greece, the nation with the second highest debt-to-GDP, at all. Japan doesn’t exactly have the reputation for reckless spending like Greece does, so you might assume their finances are stable. But a seemingly stable fiscal situation can become very unstable very quickly. 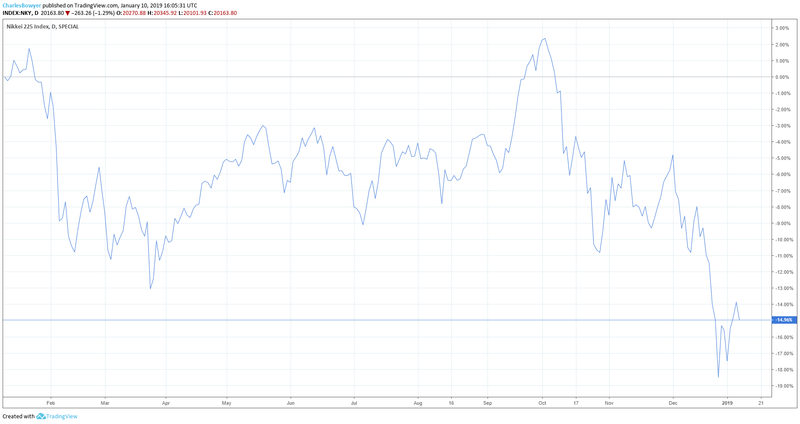 Over the past year, Japan’s benchmark Nikkei 225 Index is down 15%. Now we’ll look at the countries at the other end of the list, with the lowest national debt. Most of these countries are low in debt because they’re not modern functioning economies that are readily investable. In other words, they don’t have a lot of debt because no one will lend to them, not because they have a culture of prudence. 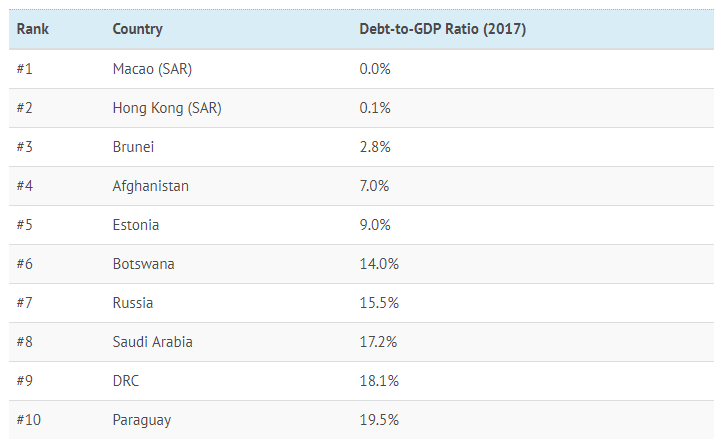 8 of the 10 lowest debt countries are some combination of too small, too politically unstable, or just too underdeveloped to for us to invest in. In the other 2, we’re overweight. Hong Kong is an exception. They’re a developed, modern economy that still manages to maintain very, very low debt. We hold Hong Kong at about 7.0%, and cap-weighted holds them at 3.7%. In Russia, #7, we have a roughly 2% weighting, compared to 0.9% for cap-weighted. Russia isn’t exactly a developed modern economy, but it’s not as small or as undeveloped as some others on this list. Russian stocks are doing moderately well, growing at 8% over the past year, when other markets are falling. 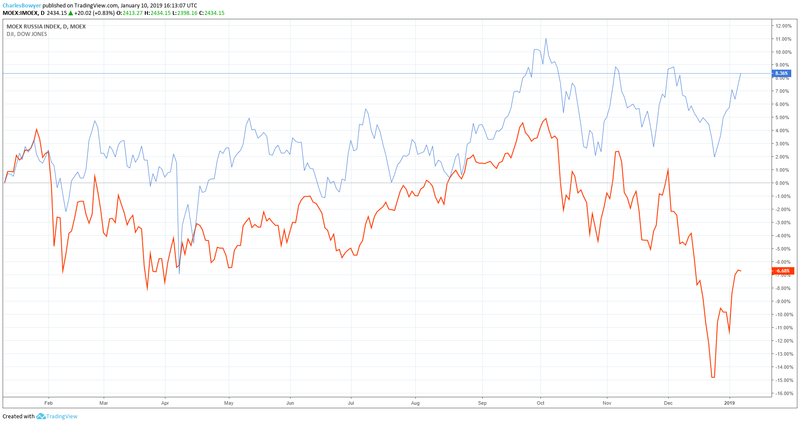 *Russian MOEX Index in blue, Dow in red. Chart courtesy of TradingView. Debt-to-GDP ratios may no longer be a point of focus in politics, but that metric should be no less important to investors than it was in 2014. In fact, the lack of concern over mounting debt makes the situation more dangerous than it used to be, as heads of state are no longer under political pressure to manage the nations finances. Investors should be more concerned with the global debt situation, not less, as a high debt-to-GDP country can easily find itself in a fiscal and financial crisis.